Glass is one of the most versatile & widely used materials for the creation of beads. Glass beads have been around since ancient times. They back to at least Roman times. Perhaps the earliest glass-like beads were Egyptian faience beads, a form of clay bead with a self-forming vitreous coating. Beads made from glass come in all forms, shapes, colours, sizes and undergo a huge, dizzifying array of production techniques to produce an endless variety of bead types .. venetian beads, cateye beads, crystals beads, glass pearls, bumpy beads, lampwork beads, etc etc. Some glass beads can be a bit rough on the inside of the hole or at the edges. Use a strong thread that can is more resistant to abrasion. You can also use a bead reamer to smooth the edges and the inside of the hole. Glass beads are normally categorized by the method used to manipulate& create the glass. Most beads fall into three main categories: wound beads, drawn beads, and molded beads. There are also composites, such as millefiori beads, where cross-sections of a drawn glass cane are applied to a wound glass core. Increasingly, dichroic glass is being used to produce high-end art beads. Dichroic glass has a thin film of metal fused to the surface of the glass, resulting in a surface that has a metallic sheen that changes between two colors when viewed at different angles. Beads can be pressed, or made with traditional lampworking techniques. Drawn glass is also a very ancient method. There are several methods for making drawn beads and they all involve pulling a strand out of a gather of glass in such a way as to incorporate a bubble in the center of the stand to serve as the hole in the bead. In Arekamedu this was accomplished by inserting a hollow metal tube into the ball of hot glass and pulling the glass strand out around it, to form a continuous glass tube. In the Venetian bead industry, molten glass was gathered on the end of a tool called a puntile ("puntying up"), a bubble was incorporated into the center of a gather of molten glass, and a second puntile was attached before stretching the gather with its internal bubble into a long cane. The pulling was a skilled process, and canes were reportedly drawn to lengths up to 200 feet long. The drawn tube was then chopped, producing individual drawn beads from its slices. The resulting beads were cooked or rolled in hot sand to round the edges without melting the holes closed; were sieved into sizes; and, usually, strung onto hanks for sale. A modern example of mechanically-drawn glass beads is the micro-bead or "seed bead", so called for its tiny, regular size. Seed beads are the most common type of modern glass bead. The seed bead is a small bead typically less than 6 mm, traditionally monochrome, and manufactured in very large quantities. Modern seed beads are extruded by machine and some, (Miyuki delicas) look like little tubes. Italian glass blowing techniques such as latticinio and zanfirico are adapted here to make beads. Furnace glass uses large decorated canes built up out of smaller canes, encased in clear glass and then extruded to form the beads with liner and twisting stripe patterns. No air is blown into the glass. These beads require a large scale glass furnace and annealing kiln for manufacture. Lead crystal beads are machine cut and polished. Their high lead content makes them sparkle more than other glass, but also makes them inherently fragile. These were (and are) made in the Czech republic, in what was once called Bohemia. Thick rods (20cm?) are heated to molten and fed into a rube goldbergian contraption that stamps the glass, including a needle that pierces a hole. The beads again are rolled in hot sand to remove flashing and soften seam lines. By making canes (the glass rods fed into the machine) striped or otherwise patterned, the resulting beads can be more elaborately colored than seed beads. One `feed' of a hot rod might result in 10--20 beads, and a single operator can make thousands in a day. Probably the earliest true glass beads were made by the 'winding' method. Glass at a high temperature high (enough to make it workable , or "ductile") is stretched around a solid core such as a metal wire or mandrel. The wire is treated with some compound to prevent the bead sticking to it, called "bead release." While still hot, the wound bead may be further shaped by manipulating with tools and paddles, by pressing or rolling it on a hard surface like marble (called "marvering"), or by rolling it in a mold. And while still hot, or after re-heating, the surface of the bead may be decorated with fine straws of colored glass. These are called lampworked beads. 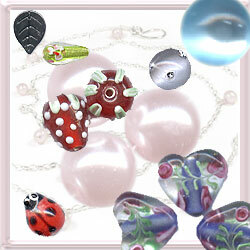 There are just so many types of glass beads that they just won't all fit nicely into any one kind of categorization. That being the case, what follows are just more types of glass beads, not necessarily falling into any of the categories above. These just denote that they are made in India. And the varieties of beads that are produced in India are wide and endless. The former Czechoslovakia was the largest manufacturer of glass beads in the mid-nineteenth century. These are also known as: Dry Powder Glass Beads or sand-cast beads. These beads originate from Ghana, Africa. They are made from scrap glass (like soft drink bottles) which is finely crushed, layered, coloured, put into a mold and fired. The technique in Ghana originated in the 16th century. There is yet another method of making powder-glass beads. It starts with finely grounded glass. Without the use of molds, the glass fragments are bound together with saliva or gum arabic. This paste is then spread over a grass stem or bottle core. After fusing in an over, the beads are usually rolled in other fragments to create colourful designs.